"You okay man?" I look over to see Varun staring at me with a faintly concerned expression and that's when I realise I have a big smile on my face. Apparently I've been beaming for a while. Before you, like Varun, wonder if I've gone a bit loony let me explain the setting. 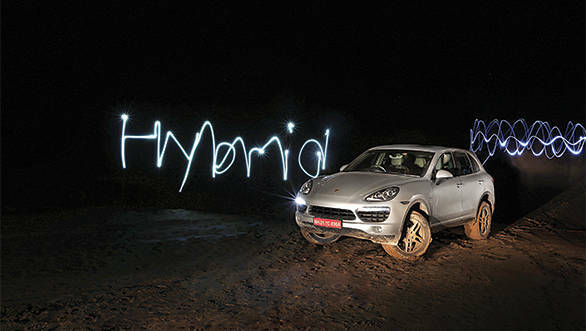 We're driving down Gujarat's excellent highways through a constant monsoon deluge in the new Porsche Cayenne S Hybrid. There's soft jazz crooning out of the brilliant Bose speakers and the vehicle feels completely isolated from the road. The suspension set in comfort mode makes the SUV feel like it's floating through fields of cotton candy. The steering (in this mode) gives you absolutely no feedback from the road, and the NVH levels are eerily low. The Porsche may have been barreling down the road at over 100kmph, but the feeling from the inside was of extreme serenity  pure automotive nirvana. But let's back up a bit, what is this hybrid Porsche? Why has Porsche even bothered to build it? Well it's all about shattering perceptions and proving points. It all started in 2002 when Porsche unveiled the big Cayenne to a rather disapproving world. Words like blasphemy and sacrilege were freely thrown around  after all here was a brutish near 2.5 tonne SUV from the masters of fast and iconic sports cars. The naysayers were silenced with one drive. 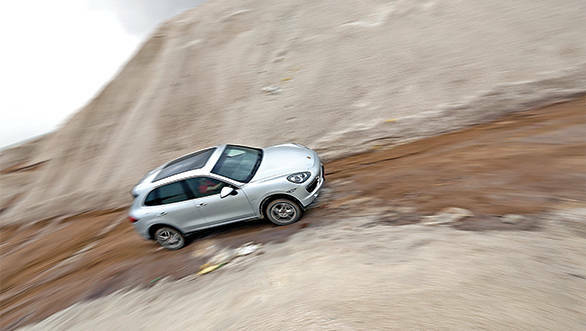 The Cayenne drove much better than it looked and was easily the most dynamic SUV of its time. Porsche went on to prove that big doesn't mean slow with the Cayenne Turbo that instantly became the world's fastest SUV. There was only one point the haters had left  500PS in big V8 Turbo may have been great for the health of the lucky soul behind the wheel but not so much so for the environment. 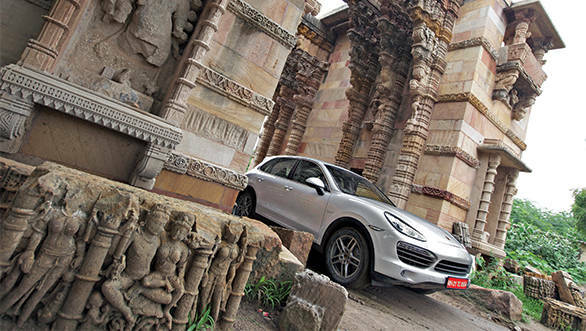 The Cayenne S Hybrid promises the solution to that problem as well. So here we are in a rather unusual vehicle  it costs about a crore after taxes, promises sports car performance, relatively high fuel efficiency, and all of that with a smaller impact on the environment. Might as well take it to an unusual location. The Rann of Kutch in Gujarat is not what you'd call unusual, it's actually quite a popular spot, and we've done plenty of stories there over the years. However almost no one goes there in the monsoon during which Kutch's salt flats simply flood over and become completely undriveable. But then again the journey is as important as the destination, and we'd have an eclectic mix of jam-packed traffic in Mumbai, super smooth highways in Gujarat, rutted back roads post Ahmedabad, and, finally, the marshy terrain that was till recently the expansive and dry salt flats of the Rann. 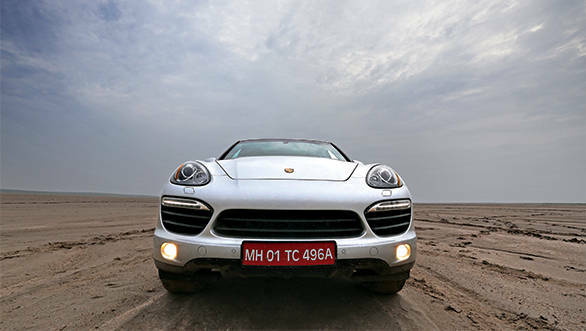 Before all that, though, we had to get out of Mumbai which was when we first discovered what most customers will love about their Cayenne. It's incredibly comfortable and easy to drive, even over what's left of our roads as the monsoon ravages its way through the city. Select Comfort mode and she just glides over almost anything you throw her way. 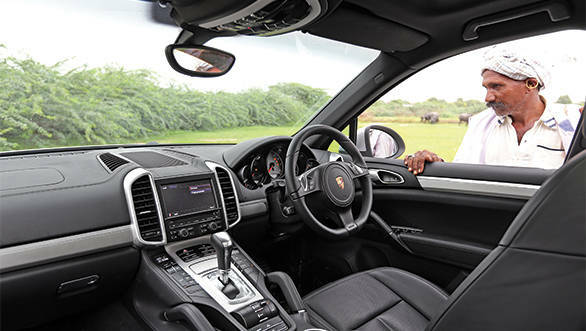 However nothing beats the way a Cayenne shrinks around its driver. The Cayenne is a very large car, but never once did I feel like I was piloting something that's nearly 5m long and 2m wide. It's a real confidence booster, both in jammed traffic or a tight mountain road. Once we left the city I discovered that Comfort mode was just a bit too comfy. The suspension starts to wallow with speed which lulls you into a dangerous zone of being cozy enough to want to take a nap. Time to switch to normal mode then. Needless to say this Porsche rides brilliantly well on our roads. But then again you already knew that about the Cayenne and this hybrid is almost identical to its siblings save for what's under the hood. So let's talk mechanicals. What Porsche has done is employ a 3.0-litre supercharged V6 petrol that's very similar to the bomb you'd find under the hood of an Audi S4. It produces the same 333PS but then Porsche added an electric motor for a further 47PS. And the total figure jumps to just 20PS less than the 400 you get from the 4.8-litre V8 in the Cayenne S. Now we're talking. Of course the whole point of the exercise is efficiency, so just how does Porsche claim to extract 12.2 kmpl from this thing? Especially considering it happens to be the heaviest of the Cayennes thanks to the hybrid set-up and 80kg bank of batteries that lies in the boot. 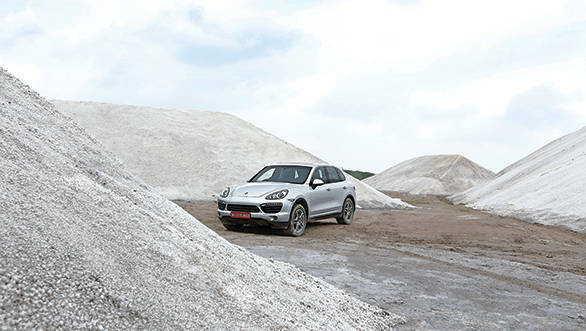 There are two essential ways the Cayenne burns less fuel and both work through a separator clutch that connects the electric motor and the engine. You're likely to experience the first technology when crawling through traffic. When small demands for power are made at lower speeds the powertrain lets the electric motor do all the work. Feather the gas from a standstill and all 2240kgs inch forward under pure electric power. And they literally inch, because if you prod the throttle even slightly heavily the engine will kick in. You can gauge how much charge is in reserve by simply looking at the 'E-meter' in the instrument cluster. We managed to drive the car in full electric mode for a maximum of just 1.9km before the engine kicked in despite exercising extreme caution with the right foot. You can also hit the small 'E-Power' button below the shift lever which makes the car stay in pure electric mode for longer and it works up to about 70kmph. Cross that speed and the mode gets deactivated and you have to press the button again when the speeds drop. The system works but only when you're at rather slow speeds. However, the other efficiency boosting system is a lot more useful in the real world. Porsche rather aptly calls this feature 'Sail mode'. It comes into effect at cruising speeds on the highway  lift off the throttle and the engine shuts down, enabling the car to quite literally coast along the road powered by the electric motor. The mode works all the way up to speeds of 155kmph, which makes it a much more usable form of power saving. The brilliance of this mode is that the wheels are constantly turning which means they are constantly charging the batteries as the motor propels them along. Sail mode can, however, be a bit intrusive when you want to make a high speed overtake. While the Cayenne's normal transition from electric mode to engine power is seamless (you really can't feel a thing) Sail mode can get a little clunky. Suppose you're doing 100kmph with the gearbox in eighth gear and you want to overtake. You step on the gas and Sail mode disengages as the engine fires into life. But at the same time the gearbox needs to drop three or four gears and this whole process while still impressively quick can get relatively jerky when compared with the sheer smoothness of the drivetrain. So that's how the car attempts to save the environment, but this is a Porsche we're talking about. The more important question is how does it perform? The company claims a 0-100kmph of 6.5s and that's a very quick time for any vehicle, forget an SUV. You immediately feel that this is one fast vehicle, but it somehow didn't feel quite as quick as Porsche quotes. To be fair we were four of us with our luggage and TV camera equipment in the boot but I think the bigger reason was the power delivery. The powertrain offers a very linear and civilised power delivery, so much so that you might be fooled into recognising it as a lack of sheer pace. The engine revs freely through most of the rev range but it does struggle a little at the final thousand revs and it makes sense to short shift to stay in the power band. 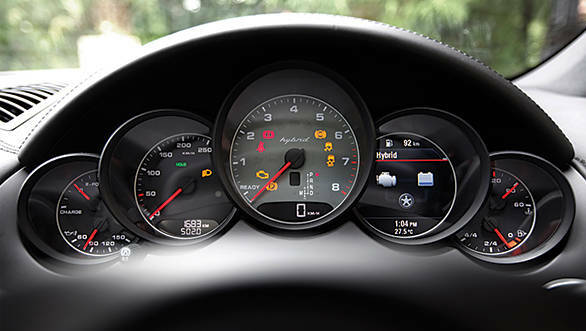 The Hybrid can easily reach speeds close to 200kmph while Porsche claims a top speed of 242kmph. The chassis is perfectly composed at all speeds and the electric steering (only in the hybrid) weighs up nicely as you progress from Comfort to Normal to Sport mode. 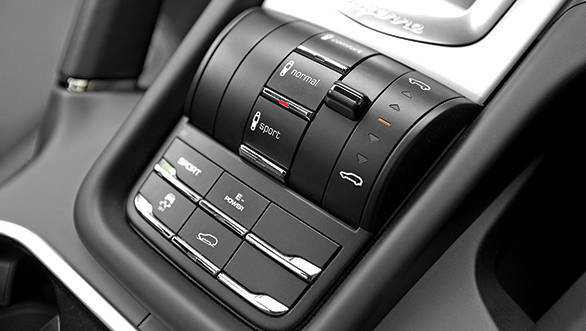 Sport mode tightens the chassis up and offers more feedback from the road to the seat of your pants. Like all Cayennes the Hybrid turns and grips with surprising ability but you do sense the added weight  it packs a hefty 210kg over the standard Cayenne. While I did expect just a little more given the 380PS/580Nm power figure I found myself more disappointed by the Hybrid's noise, or lack of it. It's quite muted and you hardly hear any exhaust or supercharger note. And this is an engine that sounds particularly good in Audi's fast sedan. You are driving what's supposed to be a sporty car despite the Hybrid badging; some more pantomime would have been nice. But does all the techno wizardry work in the real world? Well, yes but only if you are very careful with your right foot. I found that the fuel consumption would go up to about 13kmpl on the highway at a steady speed of 90-100kmph but that it could also drop to as low as 5kmpl if you were driving it very hard. 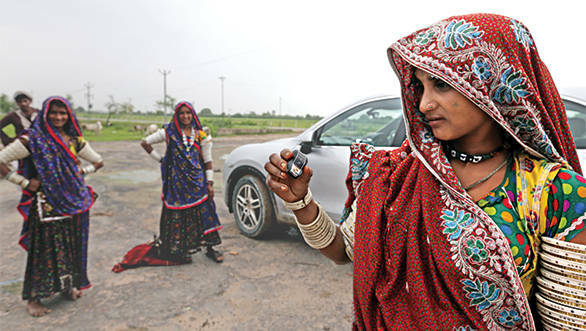 By the time we hit Ahmedabad we'd all gotten to very good terms with the car. The guys realised it was excellent for taking a nap while I was bonding well with one of the best highway tools I have experienced yet. We'd done over 500km and were all feeling as fresh as when we started. However the Rann was still 90km away and we were now on single lane country roads that were rutted and rippled with the occasional pothole along the way. The Porsche didn't bat an eyelid and we arrived at the village of Dasada in surprisingly good time. We were staying at the famous Rann Riders resort which is the go to place for any Rann aficionado. Whether its jeep safaris or venturing into the salt flats on horseback, this place offers it all. The resort itself is beautiful and full of trees teeming with nesting birds like Egrets which is understandable considering this area is also a famous bird sanctuary. Don't be surprised to walk into the dining area and see a peacock chilling on a sofa. Yeah, that's right this place has its own peacock that freely roams the premises. Rizwan the manager warns us that the Rann has turned completely marshy and getting on it is impossible. But then after he sees what we've rolled up in and with a hint of a smile he says we can give it a shot. As we follow the resort's buggy sliding through the increasingly slushy terrain I look down to find some off-road switches or modes but find nothing besides the controls to raise the ride height. The Hybrid has ditched the regular Cayenne's off-road mode controls and we have no choice but to let the all-wheel drive system do its thing as we follow the buggy through the increasingly deep ruts. The Cayenne got to the flats with impressive ease but we could only venture about 100 feet in because the SUV was sinking in under its own weight. To be fair, no off-roader could have gone much further and the Hybrid proved that it hasn't gone soft as it went green. 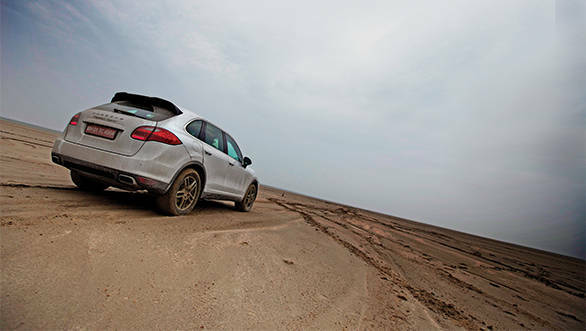 After a day of mucking about on the Rann we made the 620km back to Mumbai with surprising time and ease and we were all very impressed with the car. It rides almost as well as a Range Rover despite costing half as much and it has the potential to be rather efficient. And it drives just like you'd expect a Cayenne to. But there was just one question hanging in the air? 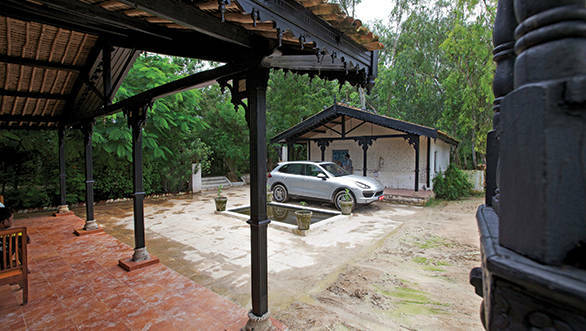 Why does one buy a Rs 87.8 lakh (ex Mumbai) hybrid Porsche? If you want to save the environment wouldn't you be better off with a Prius? To be honest, I'd much rather save an extra nine lakh rupees, switch off the lights every time I leave a room and buy the V8 powered Cayenne S for the delightful noise and power. Or there's always that mammoth V8 diesel with similar power, enough torque to tear a house down all while being similarly efficient in the real world. There's even the much cheaper 3.0-litre diesel that's reasonably quick and Rs 11 lakh cheaper. Nevertheless the Hybrid appeals to that small demographic of rich folk who want a Cayenne but feel guilty for harming the planet by using one. It may be a very small group but that's the beauty of it  there's a Porsche for everyone. As long as you can cough up the dough.